A normal coccyx consists of two or three segments. Many medical text books say that the coccyx is normally fused into one piece in adults. This is completely wrong. 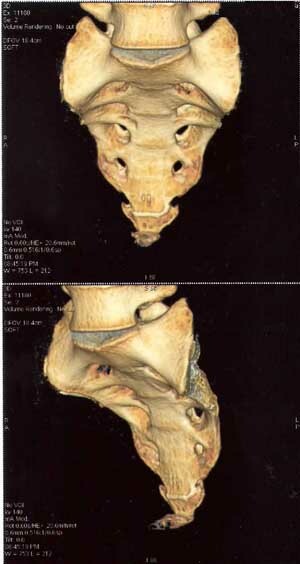 Postacchini and Massobrio x-rayed 171 coccyxes, and found that less than 10% were fused into one piece, most had two or three, and a few had four segments. coccyx angled sharply forward (example shown in the MRIs and x-ray below). I have heard from two women whose babies were facing backwards when they were born, and both the mothers and babies suffered severe pain during childbirth. After the birth, it was found in these cases that the baby's face was scratched and bruised by being dragged down the coccyx, which was presumably angled forwards into the birth canal. Some women, such as Rebecca and Gill chose to have their second baby by caesarean because of coccyx problems with their first deliveries. Alex was much more fortunate, in that natural delivery of her baby seemed to snap her coccyx back into place and cure her coccyx pain, causing only a blister on her baby's forehead. Some people with particularly long coccyxes have told me they found that this caused them pain. It seems obvious that a long coccyx is more likely than a short one to get damaged or press on the skin, but I can find no discussion of coccyx size in the medical literature. These conditions do not always cause pain, but you are more likely to have coccydynia if you have one of them. Why they should cause pain is not always clear. In the case of a misaligned coccyx, it may be that the pain is caused by the coccyx pulling on muscles or pressing on other tissues. In the case of a rigid coccyx it may be that the tissues under the tip of the coccyx get damaged easily. Bursitis (a pad of irritated tissue, like a bunion) may be caused. Postacchini and Massobrio studied x-rays of 120 coccyxes of people without pain and 51 coccyxes of people with unexplained coccyx pain. They found that a coccyx curving slightly forward was the most common type in the general public, with two thirds of people having this type. But among people with unexplained coccyx pain, two thirds had a coccyx that was strongly curved, angled or dislocated forwards. Therefore if you happen to have a coccyx that points forward more than down, you are more likely to get coccyx pain even if you don't have an accident. This conclusion is supported by a recent medical paper by the authors Kim and Suk. They used x-rays to measure what they called the 'intercoccygeal angle' - the angle between the directions that the first and last coccyx segments pointed. They did these measurements for 3 groups: those with no pain, those with coccyx pain following trauma, and those with coccyx pain of unknown origin. What they found was that the 'no pain' and 'trauma' groups both had average intercoccygeal angles of about 50 degrees, but the group with pain of unknown origin had average angles of about 70 degrees. Postacchini and Massobrio found that 8% of the people without pain had a coccyx that pointed partly left or right. In people with pain of unknown origin, more than 16% had a coccyx that went to one side. 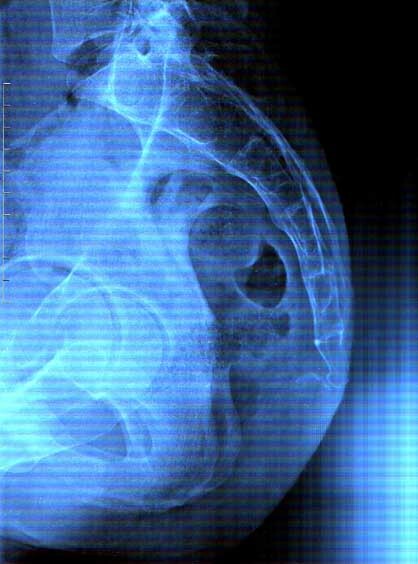 X-rays can show up a misaligned coccyx. However, as some people without pain have a misaligned coccyx, and x-ray does not necessarily prove that the alignment of the coccyx is the cause of the pain. The normal treatment of a misaligned or rigid coccyx is injections of corticosteriods. Surgery is not recommended. Treatment of a particularly long coccyx that is causing pain has not been discussed in the medical literature so far as I can discover.